Salon cash flow predictions. 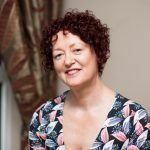 They’re a bit like having a crystal ball: they help you to look into the future and predict if or when you could run out of cash – or even better, have loads of money! For example, imagine it takes four months longer than had planned for you to break even in the salon you’ve just opened. What effect will that have on your cash several months from now? 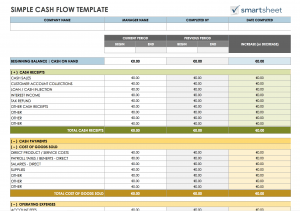 Cash flow is cash in and out; it’s different from your profit and loss. So what can it tell you about your salon and how do you put such a prediction together? Click the image to download the visual explainer. 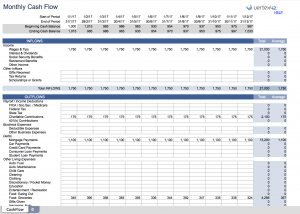 What Can Salon Cash Flow Projections Tell You? Regardless of the business, there’s always a risk of owing more than what you can pay in a month. Financial planning and cash flow predictions help you make sure you have enough funds to support the salon. The ultimate goal is, of course, to have more incoming than outgoing cash in a month. Let’s go back to that example of the salon you would have just had opened. When you started the planning, you might have been sitting with a good amount in the bank. Then your VAT bill hit, so did your tax bill and to finish you off, you had to cover the costs of a repair you didn’t expect. If you have the heads up that this was might have happened, you could have planned for it, yeah? That’s what salon cash flow projections are for. To give you the heads up, so you can perhaps put a new promotion on, sell more gift vouchers or arrange an overdraft from the bank (which truth be told is always easier to do when you don’t need it)! Because trust me, your salon’s profitability won’t protect you from business failure; good cash flow projections will. 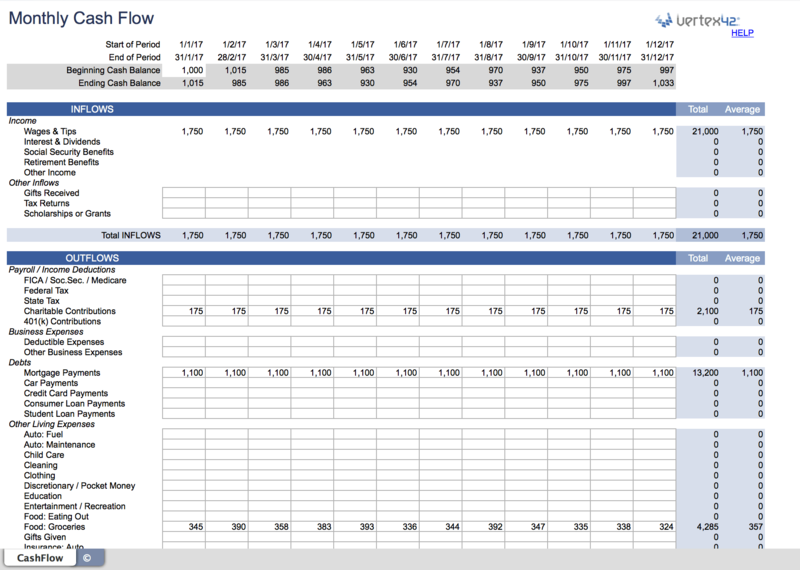 Below are the steps to follow to put your cash flow projections together. 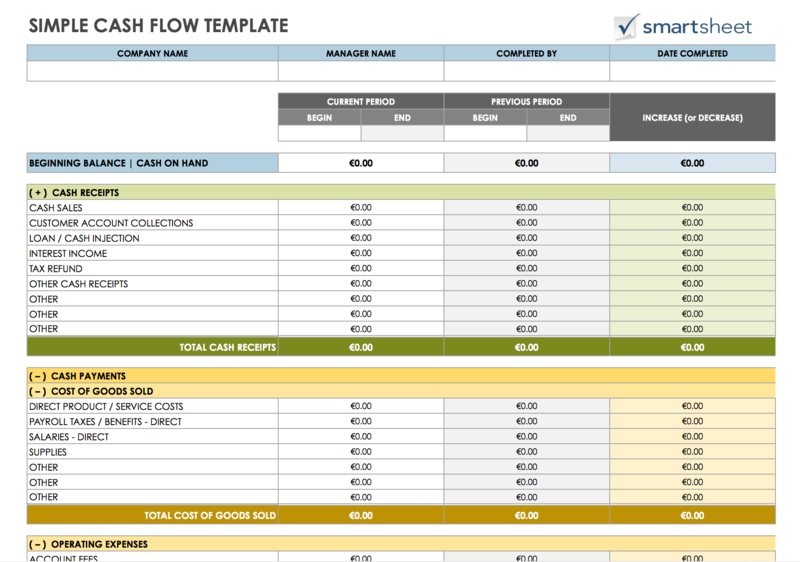 The first thing to keep in mind is that cash flow is cash in and out; so it’s different from your P&L. Your P&L doesn’t contain loan repayments, only the interest. It also doesn’t have your drawings or withdrawals from your director’s loan account. These are all things you need to add to your cash flow. Disclaimer: If you’re not familiar with using spreadsheets, get someone who is to give you a hand, or even better, get your accountant to prepare it for you. It’s probably not the best use of your time, and you don’t really want to tear all your hair out! You do need to be able to use a spreadsheet to get this right. 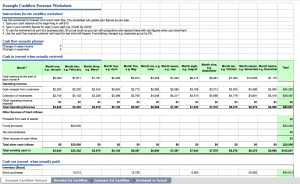 Editor’s note: The following explanations might feel a bit abstract if you’ve never had a cash flow spreadsheet. 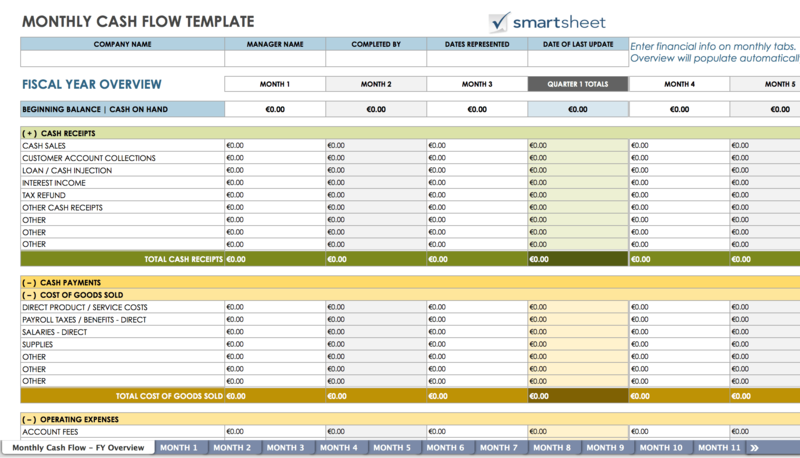 As Gloria suggests, either get your accountant to prepare this for you or, you could check out Smartsheet’s free and downloadable Monthly Cash Flow spreadsheet to help you get started or follow along with the steps below. 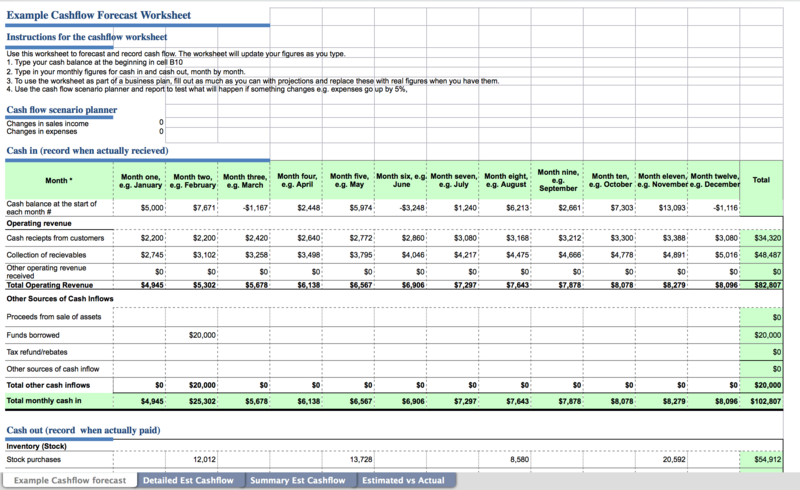 In your spreadsheet, the left column will contain income, cost of sales and expenses. The columns along the top will include the months. Start off with your predicted sales and income at the top (this can be based on your existing sales or best guesstimate). You can change these once you’ve got the rest of the projections done. Have a total row for your various sales. Remember if you get a loan or money from an insurance payout, that’s ‘cash in’ and must be accounted for. The next step is to add in ‘cost of sales’ underneath the total money in. The cost of sales is anything you buy to be able to make a sale. For example, nail polish, wax, tints, masques, oils and products for resale. It could also be self-employed beauticians or stylists. Next up is the ‘outgoings,’ like rent, rates, net wages, utilities, telephone, software, office expenses, etc. Number 5, detail ‘other cash out’ like VAT, PAYE, bank loan payments, drawings, etc. You can find expenses and other cash out by looking through your bank statements. Use a totals row underneath your expenses to add these up. The next row should be ‘Income minus Outgoings.’ Take off your cost of sales and outgoings from your sales to get this figure. The row after will be your brought forward total from the bank (B/f Bank). If your first month is February, then it’s the amount in your bank on January, 31st. This will get carried forward from now on. See point 8. The final row is ‘surplus/deficit’, and that is calculated by ‘Income minus outgoings’ plus ‘B/f Bank.’ This becomes your ‘B/f Bank’ for the next month. Don’t think you’re done just yet! 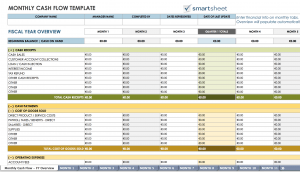 You should now use this each month to compare with what actually happened in your business. The easiest way to do this is to insert a column after your month (say February) and call it ‘Feb Actual’. Put your actual figures in bold and compare what’s happened against what you predicted. The final bit is to use your actual ‘surplus/deficit’ as your ‘B/f Bank’ in next month’s projections. That way, what actually happened in the business will have a knock-on effect on your forecasts in the months to come, allowing you to plan! As you can see, salon cash flow projections aren’t exactly the most natural thing to do yourself. But once you get it all up and running, having these projections will be invaluable in helping you run your business. Not only that but the next time your bank asks for forecasts you can say: “Hold on, I’ll send them straight over.” Boy, will you get some major brownie points! If you want more tips on your financials, join my Facebook group Knowing Your Numbers. It’s a safe place to ask questions and find out more about numbers in a supportive environment.